What is the difference between a thermopane and a double pane window? There is a significant difference. If we think about our home, windows, entry doors and patio doors have double-pane, or even triple-pane sealed units. 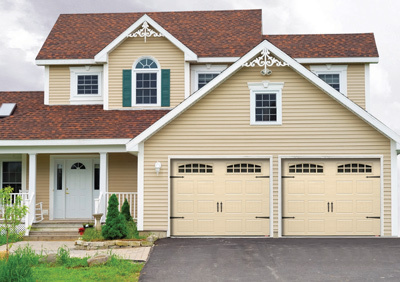 For a garage door, it can be different and that’s why it is important to ask the right questions. There are garage door dealers who will tell you they carry double-pane windows that are thermopane. But is it really that? To help you make an "enlightened" choice about adding windows to your new garage door, contact us! What’s more, we can provide you with a free quotation. What type of material is used for the windows? true glass, like that found in drinking glasses? or basically a pane of acrylic or plexiglass? What type of spacer is there between the two panes? Is it in plastic, steel or aluminum? The better the quality of the spacer, the better the retention of the gas or air contained in the sealed unit to maintain the consistent, long term performance of the thermopane. What about the air space between the two pieces of glass? The greater the space between the two panes, the higher the R‑value. For 1¾" (50 mm) and 1⅜" (45 mm) residential and commercial garage doors, what type of double-pane windows does Garaga use? each window is inserted into a seamless, one-piece (molded in a single casting), polypropylene frame, at the factory. What type of PVC is used in their manufacture? If it’s white, will it yellow over time? Will the color fade? Is made in one piece or from pieces that are head-welded in the four corners that might come apart with time? What warranty is provided against the formation of condensation the frames coming apart? As you can see, there are quite a few questions to ask in order to make the right choice. Feel free to contact us.